Faison uses words like “lame,” “slow,” and “boring” to describe Star Trek, all while fawning over the high action of Star Wars. His argument that George Lucas’ franchise is adventurous swashbuckling, while Roddenberry’s is more scientific leaning isn’t necessarily what we have an issue with—they’re very different kinds of science fiction—we just happen to disagree that science is boring in any way. Science is awesome, but no matter what else they have to say, this quarrel always seems to boil down action versus science. This is the same argument that has been going around for damn near forever, and will likely be taking place at cons and on message boards long after we’re dead. As fans of both franchises, it’s old and annoying. Sure, they both have the word “star” in the name, they’re both sci-fi, and they both involve space, but they’re two very different things, people, you can enjoy both of them (and we know there are a lot of you out there who do, it always seems like just a very vocal minority who always bring this up). We haven’t watched the whole episode of Conan, just this short clip, but we have to wonder why the subject even came up. It isn’t like this was simply where the conversation went, because Faison showed up with the clip queued up in hopes of proving his point. 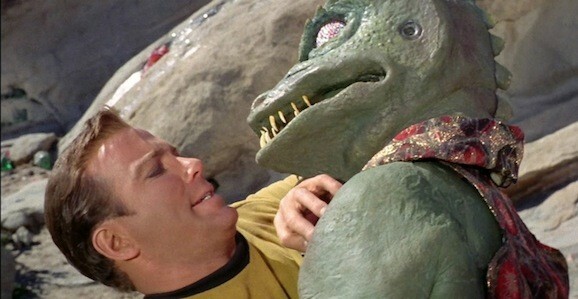 He chose the well-worn fight between Captain Kirk and Gorn that we suspect you’re familiar with. So what do you think? Does Faison make a compelling argument? Do you hate Star Trek now thanks to him? Do you even care at all? Next up, William Shatner compares, contrasts and picks his favorite medical comedy: Scrubs or M*A*S*H…? He’s probably already done that at some point. It’s like rum and beer… Both are good and alcohol but are also extremely different.